Discussion in '1st Gen. Tacomas (1995-2004)' started by r3m1, Oct 3, 2010. I think it looks good. You may want to paint your bumpers also. i think painting them black will be awesome. go for the bumpers as well. it would look sick! do it! Then the old fart steps in and says-leave it alone because your rare gold paint IMO looks better with some bright offset. Take a good look-the original rim color compliments that body well-easier on the eyes. question: did your rig comes factory color of that color or did you paint? i like the color its different!!! I like the color and the stock contrast with it... Keep it. 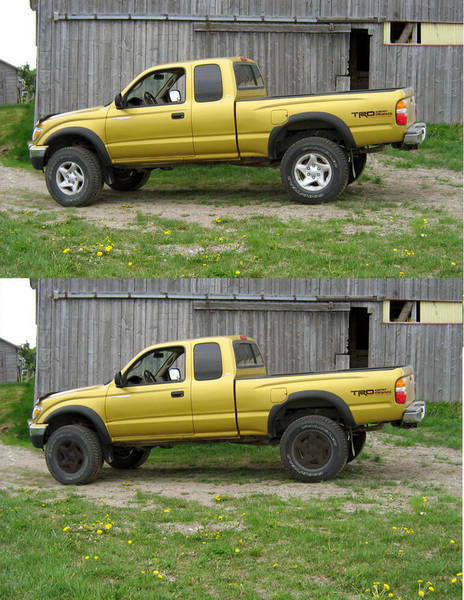 I like the colour of your truck, but in my opinion it looks better with the stock wheel colour. Maybe if you added gloss black steelies the black would look nicer, but -- and again, just my opinion -- I think many painted stock wheels have an "unfinished" look (or something). I say leave it, I like black rims with some colors, but I think they look good as is with that color. I like the color too, different. Its all in what you like though. I bet it will be 50/50 asking on here.